We dropped off Zane at the daycare, and then I dropped off Larry at his school. I got into the car and looked back. There he sat, looking back at me: Ironman. I felt kind of bad for a few moments, since he rode a good 30 minutes in the car not safely restrained. 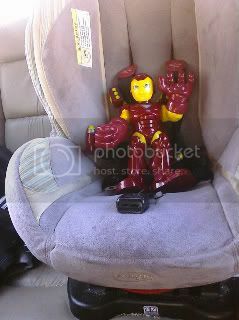 Then I thought that perhaps the fact that he's Ironman would render him impervious to most automobile crashes. I decided to take him with me. To work. I've always wanted a lackey. 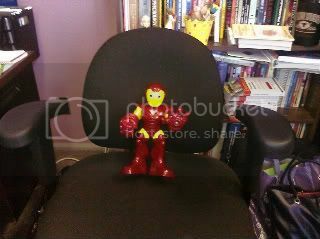 We had a brief discussion over who got the comfy chair, which I won, and then I put Ironman to work. Or rather, I tried to. He flat-out refused to go and get me coffee. He just stood there. I felt that this was certainly not the proper way for a lackey to behave. 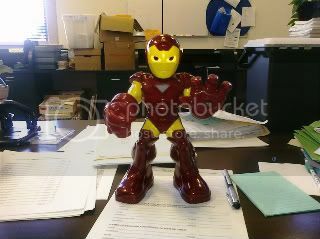 Ironman apparently has an extreme aversion to filling out forms, which I found odd for a bazillionaire. It was probably some paper cut related trauma. I can totally understand that. That's why I hate filling out forms, too. Ironman's spelling is atrocious! Hadn't he ever heard of spellchecking? Ironman responded that he was a physicist, not a dictionary. I told him to stop channelling Leonard McCoy from Star Trek. 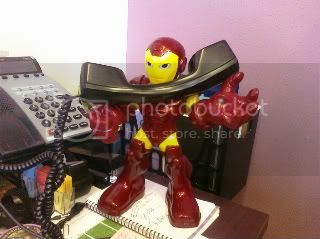 Ironman was as bad at speaking on the phone as I am. I can't tell you how many people he 'accidentally' hung up on(Sorry, Mom!)! This was very frustrating, as I had such high hopes for our office relationship. 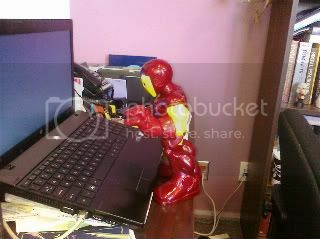 However, toward the end of the day, I did find one thing that Ironman could do in my office that really came in handy. He was a great pen holder. Brilliant! Laughing hysterically at the one where he is holding the phone! Nice blog, nice to meet you. Following from FMBT.Please come follow me when you have a chance. i can sooo relate! Following you from todays hop. Def looking forward to reading more. HILARIOUS, thank you.. I am a new follower from Tuesday Blog Hop on the Adventures of My Family of 8! 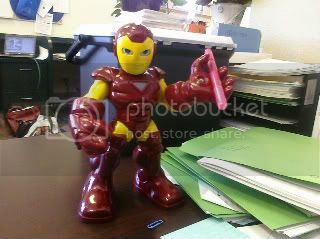 Hi, I followed you on google friends from www.madamedeals.com and I am looking for blogs that want to sponsor my facebook contest if you can help head over to the discussion tab on my facebook page Madame Deals, INC.
You know, Ironman was just mad that he was not with Zane!